I am very prideful. I wish that I was not. I am also very stubborn. I don't mind my stubbornness as much. Both tend to hinder me in game. When activated I'll stand my ground and let the world burn around me before I back down. It is truly a terrible habit. It is also what makes Vov's project, "Get Sugar are jump freighter," so amusing. Vov decided to make my jump freighter project his project. He knows he can not directly offer me ISK or buy a jump freighter. His solution has been to invite me to do DED complexes with him. That is the core reason I have done so much PvE of late. I must point out that if Vov invited me to a fleet I would go even if I was not saving for a jump freighter. It is not a jump freighter dangling from a stick to get me to PvE. On the flip side I do all the market work and Vov gets ISK transfers when things sell. He can stick to wandering low sec and ganking people. It is a good relationship that we have. There is a lot of trust involved. I'm sometimes amused because Vov, wormhole thief and ganker that is is, is the type of person that people point to and scream "This is why you can't trust people in Eve." But I trust Vov blindly. We went out and did some sites he had found. He also finds himself more productive for this with company. We did sites and then I had to excuse myself for a scheduled fleet. I was tired. Very tired. I work forty hours over three days when I work my weekend shift. Yet, I find something relaxing to my tightly wound senses to play Eve and soak in the social sphere that I have developed. I missed my boys and wanted to spend some time with them. Even if I did not make it through the entire op I'd get some flying time with them. 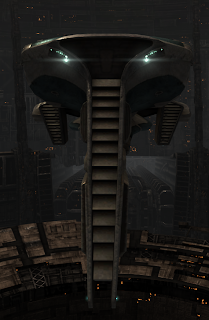 I actually flew a DPS ship. It was good. My reflexes were not what they needed to be for tackle. At one point I missed out on a kill because I was trying to point someone and forgot to shoot them. Yeah, my reflexes and mind was not where it works best. However, Talos fleet compensates for that level of derpitude. But, as the objective changed and the fleet turned into a roaming fleet I had to bail. I decided, with my murky and muzzy mind coming up with fantastic decisions, that I would solo jump home. Today, I would be strong and confident and face down the world in my Talos. I promptly jumped into high sec because my auto pilot was set on shortest and not preferenced towards low sec. The reason I realized I was in high sec was because I did not recognize the system name. I peered blearily up at the sec status and squinted. Yup. That was a .7. My security status is a -8.7. PvE with Vov has dragged it up from a -9.1. Both are not exatly the proper security statuses for high sec. I docked up. There was no chance that I'd manage to do anything reasonable after that. In the morning I will send an alt to pick up my ship. That is another reason to have alts. For when you jump your Talos into high sec when sleepy. I am sure that is a regular problem for most. As always happens when I have to bow out of a fleet they went off to do amazing things and have more fights. They've had an amazingly productive weekend. I looked at the killboard and realized that I am on track to have the most kills in a month since I started. Just over a hundred. For some that is nothing. For me, it is a lot. Plus, this is not buffered by POS modules. I had not realized that my activity had increased as much as it has. I'm never going to be at the top of the killboard. Not only do I give some strange, incorrect mathematically negative number of fucks about being at the top of the killboard but I also do not have the game time activity for it. Not that I don't play a lot. Please, do not think I do not obsessively spend time in Eve. However, I miss every other weekend and as long as that happens I will miss massive periods of high activity every month. It is not held against me. I do my best to participate when I have the time to devote to it. I also timezone better with 7-2. Time zones are something that I discovered was essential when it came to PvP. But its Sunday and that makes it my Friday this week. Monday and Tuesday here I come. For now, I'm going to go to bed. I've been well behaved and not touched any of my drafts. Deep thoughts and Sugar are not compatible creatures right now. In conclusion, the Talos has steps on its face. "There is a lot of trust involved. I'm sometimes amused because Vov, wormhole thief and ganker that is is, is the type of person that people point to and scream "This is why you can't trust people in Eve." But I trust Vov blindly." Funny how that happens - we had a gentleman camping our C2 and blowing our ships up with high degree of acumen. He left, we spoke cordially and when he was looking for a new base, we allowed him in as corp member. Trust in EVE actually matters and both parties understand it - thats why I believe this works.